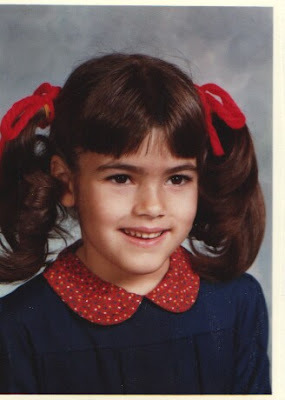 It's Show Us Your Life Friday - and today we are featuring School Pictures! I think the answer to "Would you Like to Go back to High School" can clearly be answered as "no" when you look at some of my pictures. This was my favorite picture - I love the dog ears. I can't wait for Harper to wear dog ears. 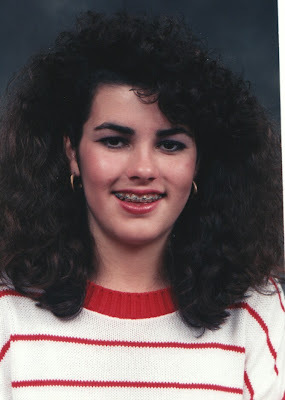 I really just don't know what to say about this picture other than "Bless My Heart"
I couldn't find my jr or sr pictures but there is just a lot more big hair and braces. I know, I know.......you are looking at my pictures and wondering who the blond girl who blogs is? I'm wondering myself. I hope your pictures are as entertaining (or humbling) as mine! Oh I love it Kelly! You look so different as a blonde! My internet is down so I'll gave to add mine tomorrow. I added your dad on Twitter today. I wonder what I would have thought 10 years ago if you'd told me we'd be "Twitter friends"? Ha! 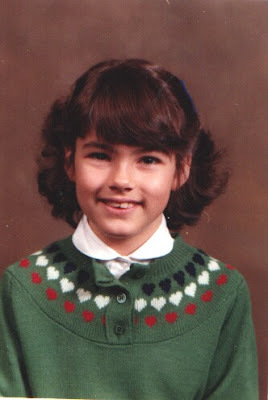 You were cute then, Kelly, but I think you are like a fine wine... you just get better with age!! My mom saw your picture the other day when she was visiting us (I know, shame on me for being on the computer while my mom was here, haha!) and she said "Oh, she is a real Southern Beauty!" :D I would agree. Love it! Have a great weekend and GO SEC! Roll Tide! All your fashions look very familiar! And I was dying to have glasses and braces when I was in school. I never got either of them! lol@you...brave brave girl. I think you're cute. big hair and all...I wish I had my pictures (my Mom has them) so I could participate. I am laughing at the fact that there are only 11 listings at the moment, and normally by now you'd have over 100. Love them!! I look back and wonder what I could have possibly been thinking on some of my outfits? Acid-wash, tight rolled jeans? Really? Fun stuff! This is so funny. I am going to put my senior pic on my fb profile just for laughs. I dont think my hair fits in the photo either. Love in the eyebrows. ha It's so much fun to laugh at yourself. I am starting my blog this weekend and I can't wait. Please answer my email i am getting PRETTY frustrated! Do you have another email you answer imediatly? Those cracked me up! You look adorable! The great thing is you look adorable! Exactly the same!! And I think our force field of hair in those days was really something special. We all had it. How did we even talk to each other? Or whisper secrets? There must have been a certain way we all leaned our heads so our hair didn't give way! ha! Thanks!! This is great fun! Kelly you are and were so cute! This one is fun I wish I had all of the pictures my mama has that would be a trip for sure! This week's topic will be so fun - I love old pictures! I think your pictures are less of a reflection of you, and more a reflection of the style of the time! And also, GO BIG XII! Love these! I wish I was at home so I could scan a few in and do a post. My 6th, 7th, and 8th grade ones would be borderline of TOO HUMILIATING to post, but I would if I had them handy! I think you wore big hair in a good way...I still remember looking at the yearbook your senior year and thinking you were Miss America! You look great no matter what color your hair (or size) your hair is! Great pictures Kelly!! Thanks for sharing. Now that we are grown, we know we didn't make the best fashion choices. Now I fear the day my kids are that age....2 boys....pimples....yuck. I want them to just stay little forever! ~WOW! Kelly you look soooo different. I had no idea your hair was so dark. I'm sure you get told that one alot. You were beautiful and still are. Not many people would be so humbled as to put up their 9th and 10th grade pics. I think your purple and yellow accessories are a subconscious tribute to LSU Tigers.... maybe not your precious Razorbacks, but SEC nonetheless!!! Ha! We're the same age and I have similar clothing and accessories in my photos! I'll have to dig through a tub and see what I can come up with! Oh my, 8th grade. Bless your heart is right! I had VERY similar glasses and some photos that could definitely fit right in with yours. (wink) I wish that I had some of them to post, but my mom has all of my school photos at her house! Thanks for sharing and adding smiles to our evenings. These are great! You are beautiful and I love how honest and open you are to the blog world. You are such an inspiration. This is great. Thanks for having this, I have looked through all 30 so far and laughed so hard at some I couldn't actually see through my tears, brilliant and brave, top drawer! cute! My 5 year old said "her hair is WOWZA!"... made me laugh! I on the other hand loved your hair and had big hair too so don't worry! I love it! Love it! Love it! I agree, the dog ears are my favorite as well. Have a fabulous weekend. I know you think Harper looks just like SCOTT, but I think she looks just like YOU! Her nose, mouth, and eyes! Those are funny pictures. I enjoy reading your blog every day. Harper's beautiful! Those are precious. You can tell you're the exact same person as you were then-so kind and sweet--just a lot better at style/clothes! Ha! Oh my ~ I had those SAME GLASSES in 8th grade. Plus braces. Plus bad hair. That 9th grade picture makes me think you might like LSU just a little bit, way way deep deep down. Way to represent the SEC West! :) Have a great weekend!!! You do look so different as a blonde! I love both looks! You are so cute!! haha! You're so cute, I love that you have no shame. NO ONE will see my middle and high school pictures. I was hideous! Lordy, lordy, these look like my pics, and I am not posting them. BIG, BIG Hair. Makes you wander what we were thinking. Graduated in 1981 so you can imagine. WHERE are the Lucy glasses????? I was hoping to see those again. :-) Love you much! I love this! So funny! You look so good as a blonde! I can't believe how dark your hair really is! I think you look a lot like Drew Barrymore in the first picture when she was in ET! YOur pictures are great...sadly, I do not have the courage to post the majority of mine, lol! That you are brave enough to post these pics and have a good sense of humor about them is just wonderful. Indeed, bless your heart :). p.s. I didn't get to comment on your last post, but I agree, Whooooo Pig SOOIE!!! I got tickets to the Razorbacks/Aggies game at Cowboys Stadium for my husband's birthday. We are SO excited!! Girl, I have some that could rival those, LOL! My husband lovingly refers to them as my dinosaur and Lion King days. ;o) (Before anyone wants to deck him, I coined those phrases...and they stuck, haha!). The dino days are my awkward elementary school years, and Lion King, well, refers to the big 80s bangs. Oh, hair, glorious hair! Happy weekend, Kelly and family! Oh my gosh you're so cute!! Ha ha! I can't bring myself to look at my braces pictures... I didn't wear them as proudly as you ha! Love it, love it, love it. Ninth grade. Hilarious! You know what though, I think we kind of look like sisters in these pictures! Same hair, same eye brows. LOL! Showing those pics makes the progress you've made look so good, right?!?!? Why is it that we ALL have pics like that...was there no "normal" back then?!? HA!! I sent an email...I know you're behind...so if you havent gotten to it that's FINE...my link is wrong on the prayer blog. I think the "s" was left off the cackles. It should be www.kristinascackles.blogspot.com for Kristina Stephens. Thanks for all you do for those that are hurting! God is truely using you to do big things!! 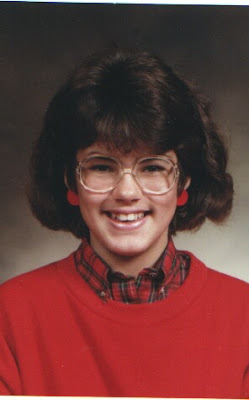 Your 9th grade picture is AWESOME!!! We all have pics like that! Lucky for me, mine are in a box in the top of my mom's closet!!!! I want to keep it that way! I enjoyed seeing the pictures of your "younger days"but you look so natural with blond hair. No school pictures I would share, red hair and freckles , nope, don't think so, Strange that now its all white and no freckles, just wrinkles. Great pics. It's always fun to reminise. Woo-hoo! Girl, you were stylin'!! 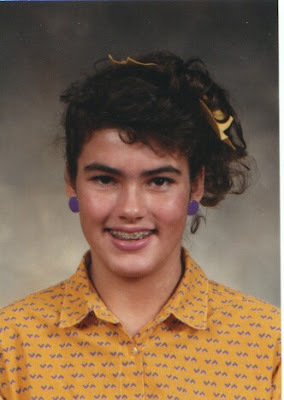 Glad I wasn't the only one with the awful perms! What was I thinking! wow! wow! that's really all i can say. the crazy thing is that your face still looks the same in the pics, but goodness girl, you have changed quite a bit! thanks for sharing the pics. Your blonde hair just looks so natural and like it belongs on you! When I saw the dark hair I just couldn't believe that it was your natural hair color. Either way,...you are a southern beauty. Love your big smile and your big heart! You loook sooo different now! LOL Love the big hair! I'm a week late posting my school pics & McLinky is closed! No biggie. I got frustrated last week b/c I deleted the darn post twice on accident! LOL I'm still learning! Love the pics. Mine aren't too crazy b/c I can't find all of my pics so I had to depend on the pics friends had!